In this study, the response of local sharp-notched SUS304 stainless steel tubes with different notch depths of 0.2, 0.4, 0.6, 0.8 and 1.0 mm subjected to cyclic bending at different curvature-rates of 0.0035, 0.035 and 0.35 m-1s-1 were experimentally investigated. The tube bending machine and curvature-ovalization measurement apparatus, which was designed by Pan et al. , were used for conducting the curvature-controlled cyclic bending. For a constant curvature-rate, the moment-curvature curve revealed that the cyclic hardening and became a steady loop after a few bending cycles; the notch depth had almost no influence on the curves. Moreover, the ovalization-curvature curve increased in an increasing and ratcheting manner with the number of bending cycles. Large notch depths resulted in larger ovalization of the tube cross-section. In addition, for a constant notch depth, higher curvature-rates led to larger cyclic hardening and faster increasing of ovalization. W. F. Pan, T. R. Wang, and C. M. Hsu, “A curvature- ovalization measurement apparatus for circular tubes under cyclic bending,” Experimental Mechanics, vol. 38, no. 2, pp. 99-102, 1998. W. F. Pan and Y. S. Her, “Viscoplastic collapse of thin- walled tubes under cyclic bending,” Journal of Engineering Materials and Technology, vol. 120, no. 4, pp. 287-290, 1998. K. L. Lee, W. F. Pan, and J. N. Kuo, “The influence of the diameter-to-thickness ratio on the stability of circular tubes under cyclic bending,” International Journal of Solids and Structures, vol. 38, no. 14, pp. 2401-2413, 2001. 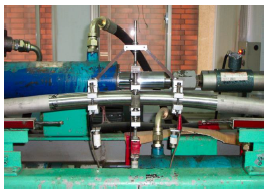 K. L. Lee, W. F. Pan, and C. M. Hsu, “Experimental and theoretical evaluations of the effect between diameter-to- thickness ratio and curvature-rate on the stability of circular tubes under cyclic bending,” JSME International Journal, Series A, vol. 47, no. 2, pp. 212-222, 2004. K. H. Chang and W. F. Pan, “Buckling life estimation of circular tubes under cyclic bending,” International Journal of Solids and Structures, vol. 46, no. 2, pp. 254-270, 2009. K. L. Lee and W. F. Pan, “Viscoplastic collapse of titanium alloy tubes under cyclic bending,” Structural Engineering and Mechanics, vol. 11, no. 3, pp. 315-324, 2001. K. L. Lee, C. M. Hsu, S. R. Sheu, and W. F. Pan, “Viscoplastic response and collapse of 316L stainless steel tubes under cyclic bending,” Steel and Composite Structures, vol. 5, no. 5, pp. 359-374, 2005. P. K. Shaw and S. Kyriakides, “Inelastic analysis of thin-walled tubes under cyclic bending,” International Journal of Solids and Structures, vol. 21, no. 11, pp. 1073-1110, 1985. K.-L. Lee, S.-B. Chien, and W.-F. Pan, “The Effect of the Curvature-Rate on the Response of Local Sharp-Notched SUS304 Stainless Steel Tubes under Cyclic Bending”, AITI, vol. 1, no. 1, pp. 1-6, Jul. 2016.